Color Grading company Kontrast Media (www.kontrastmedia.com) asked us to improve their current workflow based on external devices (mainly FireWire 8). - MacPro OS Snow Leopard with Maya (latest version) and AE CS5. - Quantel Pablo running on Windows 7. When we first walked in the Quantel was pretty much on its own with no managed shared connectivity to the other workstation mentioned above. Of course like lots of offices, all machines were all connected to a switch that would allow any user connect to any machine. Which slows down any post production workflow. Our first step was then to add a volume sharing software on all workstations in order to manage and control all privileges. 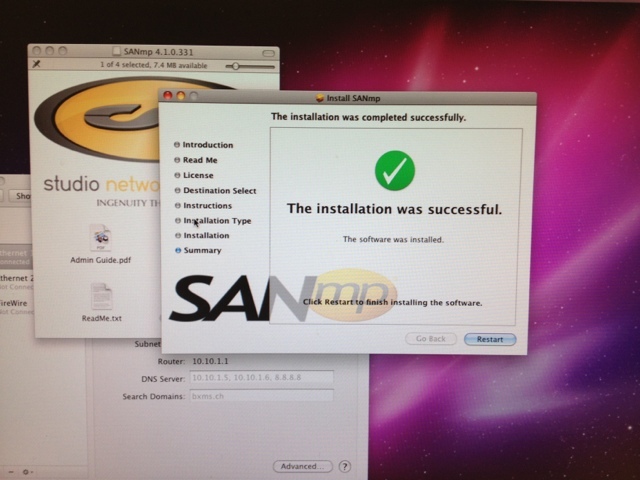 We installed sanMP v.4 by Studio Network Solutions which is a triple cross platform SAN sharing software. Then we brought in two MacPros equipped with single port Fibre channel cards that run on SSD OS drives for faster boot up and file exchange bandwidth. We then installed a 12 TB SAN with 4 Fibre Channel direct connect ports that allowed us to directly connect the new MacPros and the Quantel Pablo. Finally, we connected the iMac and the remaining MacPro over iSCSI directly to the SAN. Right away the disk performance reached up to 350MB/s for both the Quantel and the MacPros, allowing for two simultaneous real time 2k playback. After a very successful install, we were asked if R3D files could be read on our SAN. R3D files require a Red Rocket card for any real time playback, therefore we suggested the colorist to transcode their R3D files to DPX till they can get a brand new Red Rocket Card. We know it's been a very long time, however we will now post about post production workflow on a daily basis. Next topic: Quantel Pablo and Studio Network Solutions with Q Logic Fibre Channel Connectivity.